For superior towing services in the Arley, Alabama area, look no further than Hearn’s Salvage & Wrecker Co. Locally owned and operated since 1960, we are a Christian company that is built on a foundation of providing service with integrity and honesty to each of our clients and customers. When your car refuses to start or leaves you stranded in an inconvenient location, it can cause a great deal of stress and have you asking lots of questions. How will you get your car to the shop and get yourself off the road and back home? Don’t worry: Just call Hearn’s Salvage & Wrecker. We’ll get you off the road, and your vehicle into the shop or back to your home and help diagnose and repair your automotive problems as quickly and accurately as possible. Our trained and professional staff aims to arrive on time and complete your project promptly, leaving you assured that you and your car will be securely and safely transported. We also respond to roadside assistance calls including flat tire changes. Have you locked your keys in your car? No need to call a locksmith, we can help you with car lockouts. Our wrecker services are also capable of handling vehicle removals and pullouts for vehicles large and small. Did you know we offer Roadside welding? Call us for those unexpected times when you need help the most. We can fix any welding problem on any type of vehicle, 18 wheeler, and all types of trailers. 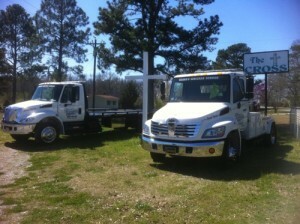 If you are in need of prompt towing and roadside assistance, contact Hearn’s Salvage & Wrecker today. Our tow trucks are standing by to assist you!